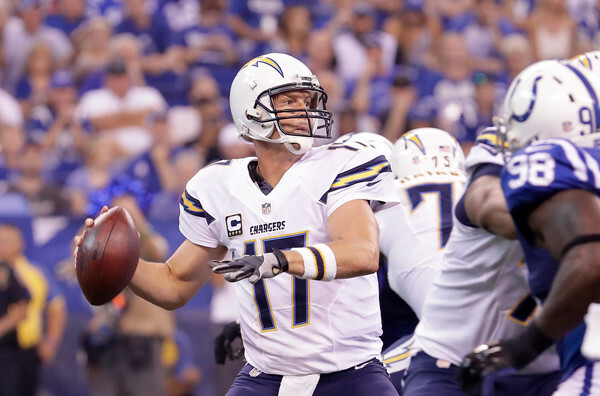 Philip Rivers threw for 326 yards last week against Indianapolis but failed to throw a touchdown pass which capped his fantasy ceiling for the week. But in another extremely favorable matchup in Week 4, Rivers should be a locked-in QB1 for fantasy owners against the Saints. Forgive me if you’ve heard this before: The Saints defense was historically bad last year. Believe it or not, they’ve actually been worse through three games this year. The team has allowed 299 passing yards per game and a league-worst 149.3 rush yards per game. We saw the Falcons take advantage of the Saints run defense last week with Tevin Coleman and Devonta Freeman combining for nearly 300 yards from scrimmage and four touchdowns. So you’d have to think that after getting gashed on the ground, New Orleans will focus on stopping Melvin Gordon this Sunday. That would leave Philip Rivers with ample opportunities to produce through the air. Rivers has yet to throw an interception this season, and the Saints defense has yet to pick one off. Rivers also ranks among the top five quarterbacks in the NFL with a 68.7 percent completion percentage and 109.5 passer rating. That’s pretty impressive considering he’s without some of his best pass-catchers inKeenan Allen (knee), and Danny Woodhead (knee). Despite not throwing a touchdown pass last week, Rivers still has five on the season and managed to successfully spread the ball around to eight different receivers against the Colts. With Dexter McCluster presenting a pass-catching threat out of the backfield (it will be his second game with the Chargers) and the Saints struggling to stop anyone, Rivers is set up perfectly for a big fantasy outing in Week 4. This one is less about Joe Flacco and more about how poorly the Raiders defense has played this year. Even with an improved performance last week against the Titans, the Raiders defense still ranks dead last in the league in total yards per game allowed (476), passing yards per game allowed (340) and completions of 20-plus yards (16). So you’d have to imagine that the Ravens are going to attack Oakland’s secondary early and often on Sunday. With the reemergence of tight end Dennis Pitta(who leads the team in receptions and receiving yards), veteran Steve Smith working his way back to 100 percent, the rebirth of Mike Wallace and the continuing development of Breshad Perriman, the Baltimore receiving corps that we thought was extremely sparse in the offseason actually has shown some promise this year. Plus, the Ravens‘ run game is virtually non-existent: Terrance West and Justin Forsett have combined for a mere 217 rush yards and Flacco has Baltimore’s only rushing touchdown. Flacco just welcomed an elite baby girl into the world earlier in the week and if there’s anything that we can get on board with here at the Fantasy Stronghold, it’s narratives like this. The last time Flacco had a baby during the season (Week 1, 2013) he threw for 362 yards, two touchdowns and two interceptions for 18.48 fantasy points. All kidding aside, Flacco should have no trouble producing fantasy points against one of the worst pass defenses in the NFL. Browns running back Isaiah Crowell got FedEx Air and Ground nominee honors following his Week 2 performance (133 rush yards, rush touchdown) and has a good shot at earning another nod this week. Crowell faces a Washington defense that has allowed the third-most fantasy points per game to opposing running backs thus far. The Redskins defense is tied with the Saints for the most rushing touchdowns allowed (six) and only three teams have allowed more rush yards than Washington this year. To put it simply, it’s sort of a matchup made in heaven for the Browns‘ primary back. He’s currently tied for second in the NFL in rushing yards (274) and is averaging 6.1 yards per carry. With an average of about 91 rushing yards per game, a 1,000-yard season is definitely attainable. Plus, Crowell is averaging 15 rush attempts per game, a solid uptick from the 11.2 he saw last season. With Cleveland’s quarterback situation a mess right now, expect the Browns to lean on the run game in Washington on Sunday with Crowell as the centerpiece of the offense. With Doug Martin sidelined in Week 3, Charles Sims shouldered 19 touches for 124 yards from scrimmage and a touchdown against the Rams. The Buccaneers will look to their young runner once again in Week 4 to help balance out the offense against a tough Denver defense. But for fantasy owners worried about Sims’ matchup against the Broncos, it’s worth noting that Denver surprisingly ranks 27th in the NFL in run defense, allowing 127.7 rushing yards per game this season. Tampa Bay’s head coach Dirk Koetter recently said that he wants the team to pass less often — the Bucs currently lead the NFL in pass attempts, with Jameis Winston slinging it over 50 times in each of the last two games. That will definitely have to change against Denver since the team has held all three opponents this season to fewer than 200 passing yards and has the second-most sacks (12) this year. Expect Sims to get another huge workload, as the Bucs will look to exploit the Broncos run defense the way the Bengals did with Jeremy Hill (97 yards, two touchdowns) last week. And if they get behind, Winston can always dump off short passes to Sims and let him gain yardage after the catch. One way or another, Sims should be able to get it done for his fantasy owners on Sunday.